Chapter 1: "The Art of Making a Friend"
Chapter 2: "Far Cuter Digimon"
Adapts "Digimon, Digimon Everywhere" and "To Fight or Not to Fight"
Adapts "To Fight or Not to Fight," "It Came From the Other Side" and a little bit of "Digimon, Digimon Everywhere"
Chapter 4: "Secrets and Anger Management"
Adapts "O Partner, Where Art Thou?" Renamon is approached by Impmon, a Digimon supposedly without a Tamer, who tries to convince her she's playing a fool's game, but Renamon ignores him an promptly departs. Rika recalls how she met Renamon, after winning the D-1 Tamer Digimon card tournament, but then races to help Renamon in battle against Dokugumon. When Renamon is critically injured and Rika allows her emotion to show through, Renamon Digivolves into Kyubimon, and destroys Dokugumon. Chapter 5: "Big Trouble in Little Tokyo"
Adapts "Now You See It, Now You Don't" and "A Question of Trust"
Later, Impmon convinces to Guilmon to have some "fun" with him in the park, scaring couples, but the Bio-Emergence of a Devidramon distracts them both, and Guilmon runs off to fight it. 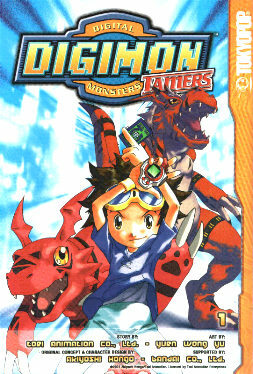 Takato arrives on the scene and Guilmon apologises for disobeying him and leaving his hideaway, but Takato tells him to forget it - and Guilmon Digivolves into the monstrous Growlmon and destroyed Devidramon. Chapter 6: "Dazed and Confused"
Adapts "Not As Seen on TV" and "The Icemon Cometh"
Thankfully, Growlmon turns out to be harmless, but Takato needs Henry's help to hide him. They try camouflage paint in the park, but Rika and Renamon prove it's no use when another Digimon is looking. A rainstorm starts, washing the paint off of Growlmon, and Takato breaks down - causing Growlmon to De-Digivolve. Rika, meanwhile, wants to know how Guilmon and Terriermon can Digivolve when they don't fight nearly as much as Renamon does, and finds herself accosted by IceDevimon, who promises he can give her answers. Henry and Takato break off a Modify Card training session to help her, but IceDevimon proves too powerful. Renamon then makes her entrance, and IceDevimon cuts her down. Chapter 7: "Freeing the Digivolution Convolution"
Adapts "The Icemon Cometh" and "Much Ado About Musyamon"
The Tamers manga went through at least two preliminary logo designs before the one on this finished volume was settled on. First, the series was simply called "Digimon Series Three," and had the same logo as Tokyopop's 02 series, except with a green strip saying "Series Three." This was seen on advance images of this volume's cover (right). The second design was seen on advance images of volume two's cover - we'll get to it on it's own page. The third and final design, visible on the image above, first showed up on advance images of the third volume's cover. Note that it still makes use of the 01/02 "Digimon" logo, rather than the modified season three version. Many panels in this manga are direct copies of still scenes from the cartoon. It happened a few times in the past, but this first Tamers volume takes it to a new level. It would be too bothersome to list them all - odds are you'll know 'em when you see 'em. Chapter 1 begins in media res, with Takato discovering Guilmon. The rest of "Guilmon Comes Alive" is then related in a flashback, but it's a full-length one, rather than the very abbreviated one we got for "And so it begins..." back in the 01 manga. However, it's early scenes are cut - we do not see Takato finding or slashing the Blue Card, and no explanation is given for how he gets his Digivice. The scanning of Guilmon's images happens by accident when the pages are blown into the air by the wind. Calumon's arrival on Earth happens at the end of the chapter, rather than at the start, like in the episode. In Chapter 2, Takato and Henry meet in the hallway, as soon as Henry sees him, rather than outside. Renamon and Guilmon's battle from the end of "Digimon, Digimon Everywhere"/start of "To Fight or Not to Fight" does not occur. Instead, Guilmon's first fight with Renamon is the one they have in the parking garage in "To Fight or Not to Fight" - except that it doesn't play out the way it did in the anime, and instead, plays out like the fight in the park. The battle with Gorillamon in the present day from "It Came From the Other Side" does not occur. Also, rather than accidentally Digivolving Terriermon during the video game in his flashback, Henry does it intentionally. As with Takato, there's no explanation for where his Digivice came from. Renamon's battle with Goblinmon from "Digimon, Digimon Everywhere" is included at the end of Chapter 3, after the events of "It Came From the Other Side." However, the Goblinmon does not Digivolve into Fugamon. The events of "Dream a Little Dream" are cut completely. While most of the episode could have been skipped without incident, there's one important thing that is therefore not done in the manga - the Tamers do not meet Calumon. Hence, he just happens to pop up when needed (not unlike the anime, but at least he knew the Tamers and their Digimon there). Lianne Sentar, the English adaptation writer, clearly picked up on this and decided to have a little fun with it - in Chapter 7, Calumon cheerfully (and truthfully) proclaims: "Yay! I'm a living plot device!" The battle with Allomon from "O Partner, Where Art Thou?" is omitted, and Renamon's conversation with Impmon is much shorter, though it boils down to the same thing. Again, no explanation is given for Rika's Digivice. It also takes until this chapter before Hypnos even appears. In Chapter 5, Guilmon disappears right away, rather than starting to and then not, as he did in the anime, hence we're plunged right into the action, but it's over before we know it as the Tamers simply go in, get Guilmon, and come out. Hypnos do not deploy Yuggoth, they merely watch the energy readings of the field. Guilmon doesn't walk off and leave Impmon in the adaptation of "A Question of Trust," and Takato doesn't yell at him for scaring people. Instead, Devimon attacks Guilmon right away, rather than flying over the city first, and Takato arrives in time to see this, and Guilmon apologises for not doing as he was told. A sizeable chunk of "Not As Seen on TV" is dropped - all of Takato's own attempts to get Growlmon to De-Digivolve are removed, as is Growlmon's night in the tunnel and brief disappearance. The chapter begins right away with the camouflage painting. Nicely, the silliness of the rainbow absorbing Growlmon's data from the anime is done away with, and it's Takato's tears that are explicity stated to make Growlmon De-Digivolve. Renamon doesn't Digivolve into Kyubimon to battle IceDevimon, and Guilmon doesn't defeat him with a card combo - instead, he just Digivolves to Growlmon. Rika doesn't renounce Digimon after the IceDevimon imbroglio, she is just forced to realise that Renamon isn't the most powerful Digimon around. We do not see Hypnos use Yuggoth to stop Musyamon Bio-Emerging, so there's no explanation given for why he doesn't the first time. Takato doesn't take Kazu and Kenta to meet Guilmon. And, just in general, neither Suzie nor Jeri appear in real time in this volume, even though they made several appearances in these episodes in the anime, so none of their scenes are included. Suzie does get one, brief appearance when Terriermon briefly thinks of her in Chapter 7. Kazu and Kenta only get to appear in Chapter 1, in the bed-wetting joke scene, and don't appear any more in this volume. Similarly, as noted above, the Hypnos crew make very few appearances, and never do anything to affect the story in the way they did in the anime. "Moumantai" is consistently spelled as "Mouh Mahn Taih." The image of Guilmon at the top of page 60 is a direct copy of his model sheet image, with a slightly different facial expression. One of the Digimon that wants Rika to tame them is specifically identified in dialogue is Devimon, but there's no Devimon silhouette in either the manga or the anime. The Digimon the word balloon appears to be emanating from is Musyamon. The couple that Impmon scares in Chapter 5 were named Hiroshi and Hiroko in the anime, but the manga renames them as... wait for it... Mimi and Jo! Sounds to me like Lianne Sentar likes herself some Jyoumi!